FACSAria II (BD Biosciences, San Jose, CA): Three laser system capable of high throughput sorting (25000 EPS) with greater than 99 percent purity. It also has high performance analysis capabilities for assays like cell proliferation, immunophenotyping, apoptosis, etc. It can perform four-way aseptic sorting on tubes, slides and micro well plates and also analyze 10 different parameters. It's capable of single cell or specific number of cells sorting. Improvements in fluidics and optics have allowed for higher speed sorting (25,000 events/sec at 70psi using a 70um nozzle) with enhanced overall sensitivity. The system uses fiber optic guided solid state 488nm, 635nm and 405nm diode lasers along with fiber guided emission collections (four colors plus scatter off the 488nm and two colors off the 635nm line and two colors off of the 405nm line). These traits allow for an instrument that does not require the extensive alignment optimizations inherent to the jet-in-air sorters making for increased reproducibility in identifying and sorting dim population. Photodiode detector with a 488/10 bandpass filter. Photomultipler with a 488/10 bandpass filter. Three fixed-fiber apertures for the 488, 633 and 405-nm lasers. 564–606 nm or 563–589 nm PE. 675–715 nm or 665–685 nm PE-Cy™5 or PerCP or PI. 515–545 nm Alexa Fluor® 430 /AmCyan or BV510 or V500c. 430–470 nm Pacific Blue™ or DAPI or Hoechst or BV421 or V450. Sample input, software-adjustable: 4, 20, 37 and 42°C. Sample output for sort collection: water recirculation unit. 405-nm solid state diode, 30-mW fiber power output. 488-nm solid state, 20-mW laser output. 633-nm HeNe, 17-mW laser output. Violet: 450/50 (Pacific Blue™ or DAPI or Hoechst or BV421 or V450); 502 to 525 nm (AmCyan, or BV510 or V500c). Blue: 530/30; 585/42; >670; 780/60 nm; FITC, PE, PerCP or PerCP-Cy5.5 PE-Cy7 (525, 575, 678 or 695, 785 nm). Red: 660/20 (APC); 780/60 nm (APC-Cy7/APC-H7). Canto II (BD Biosciences, San Jose, CA): A three laser, eight Color Analyzer with 488nm, 647nm and 405nm wavelength laser system. It is capable of high-performance analysis for assays like cell proliferation, immunophenotyping, cell cycle, apoptosis etc. 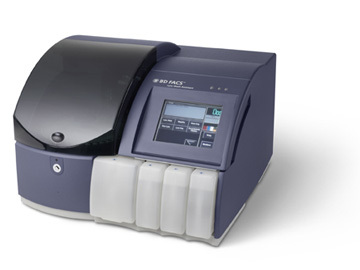 BD FACS Canto system is an easy-to-use benchtop analyzer that delivers proven performance, accuracy and high-quality results. The BD FACSCanto II features many innovations, including a true fixed alignment flow cell to minimize startup time and improve reproducibility. The optical system features a patented design that maximizes signal detection and increases sensitivity and resolution for each color in a multicolor assay. LSR II is equipped with a red (633 nm) and blue (488 nm) laser with filter sets that allow simultaneous analysis of up to six colors. It has a single flow cell for use with five mL tubes, and there is no temperature-control for samples during analysis. *No plate reader is available for this instrument. Blue: FITC (530/30), PE (575/26), PE-Cy7 (780/60), and PerCP-Cy5.5 (695/40) filters. Red: APC (660/20) and APC-Cy7 (780/60) filters. 488nm Laser- RED-R (661/15), NIR-R (785/70). 642 nm Laser- GRN-B (525/30), YEL-B (583/26), RED-B (695/50), NIR-B (785/70). GRN-B: FITC or Alexa 488 or GFP or SYBERgreen or Sytox green or CFSE. YEL-B: Alexa 555 or PE or sytox orange or CFSE or sybergreen. RED-R: Alexaflour 647 or APC or CD647 or cy5 or Qdot655 or DRAQ5 or EtBr or sytoxred or TO-PRO-3. RED-B:7AAD or PI, PEAlexa647 or PE alexa700, Pecy5 or Pecy5.5, PercP or PercPcy5.5. NIR-B: PE-Alexaflour750 or PI or Pecy7. Guava easyCyte 8 High Throughput System (HTS): The easyCyte 8HT instrument pair the power of a 150 mW blue laser (488) with the expanded multi-channel capacity of a red laser (642) to provide six channels plus FSc and SSc, for a total of eight parameters. 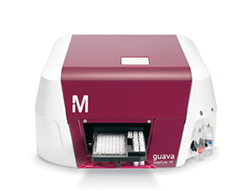 The guava easyCyte™ HT instruments provide high throughput analysis with a robotic sample tray that automatically handles a 96-well micro-plate and up to 10 sample tubes. It has a patented, micro-capillary flow cell that eliminates the need for sheath fluid and provides absolute cell counts. This translates into less complexity, smaller samples and minimal waste, saving you both time and money. Plus, the flow cell is self-aligning and user-replaceable to reduce downtime and service visits. No laser alignment or sheath fluid required. Uses smaller sample volume and generates less waste. Flow cell is user replaceable for minimal downtime. Aspirates sample directly from the tube. Absolute Cell Counting and Viability. 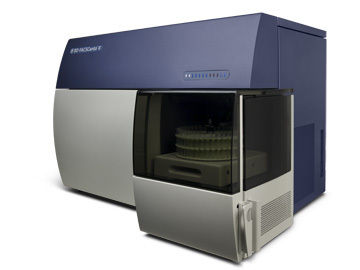 Lyse Wash BD Biosciences, San Jose, CA): The BD FACS™ Lyse Wash Assistant (LWA), with its patented cell wash technology, automates sample preparation for flow cytometry applications. It lyses, mixes, washes, and fixes samples with minimal labor. Automating incubation and washing, the LWA batch processes up to 40 patient samples per run to reduce hands-on time and operator-induced variability in laboratory data. 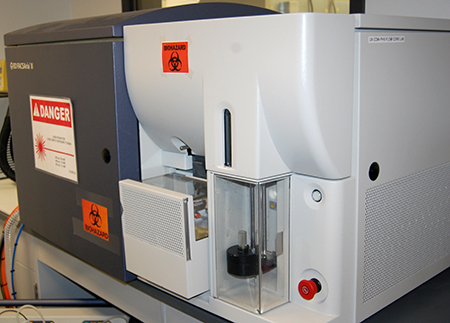 Samples can be transferred to a BD FACSCanto or BD FACSCalibur flow cytometer for analysis using the LWA carousel.